‘Arts Action’, University of Dundee Writers Read Forum, Tonic Cafe, Nethergate, Dundee, 10 October 2018. ‘A Righteously Awesome Eighties Christmas’, Christmas Lecture at the Stirling Smith Art Gallery and Museum, Stirling, 13 December 2017. ‘Author Q&A’, Presentation for the Tay Writers' Group, The Shore, Dundee, 10 November 2017. 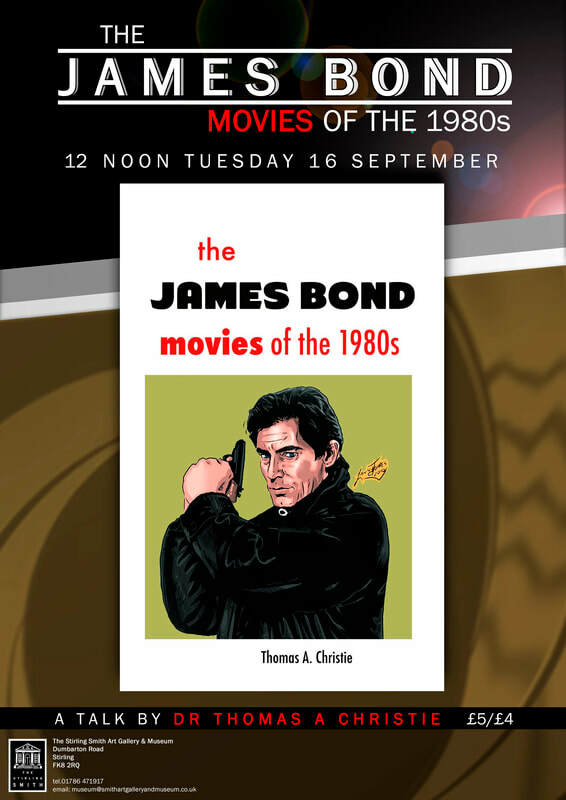 ‘The James Bond Films of the 1980s: Themes, Politics and Narratives’, for Off the Page: The Stirling Book Festival 2014, The Stirling Smith Art Gallery and Museum, Stirling, 16 September 2014. ‘Interpreting the James Bond Films of the 1980s’, Lecture for The Probus Club of Berwick-upon-Tweed, Berwick Parish Church Centre, Berwick-upon-Tweed, 23 July 2014. ‘Depictions of Dementia in Modern Cinema’, Keynote Speaker at the 2014 Annual General Meeting of the Alzheimer Scotland Action on Dementia Stirling and Clackmannanshire Branch, The Order of Malta Building, Stirling, 28 May 2014. 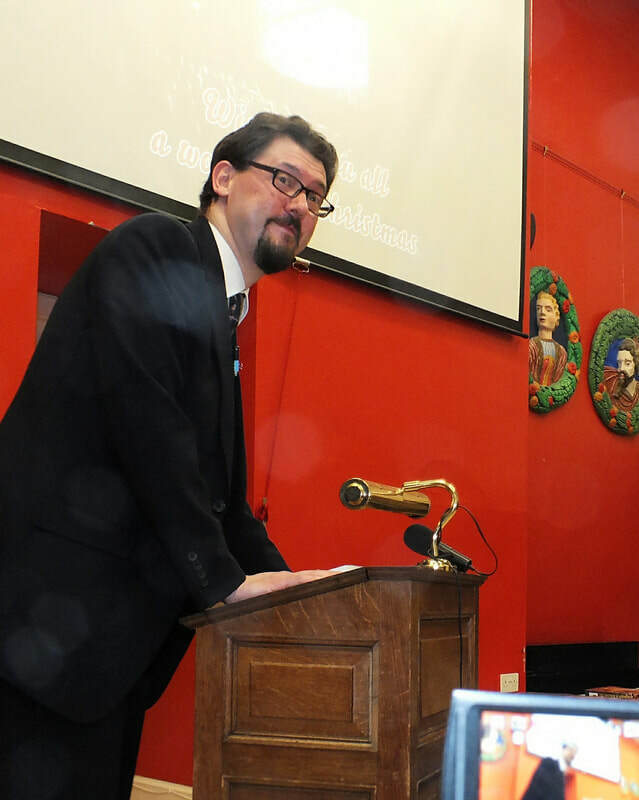 ‘Behind The Shadow in the Gallery’, for the official book launch of The Shadow in the Gallery, The Stirling Smith Art Gallery and Museum, Stirling, 5 December 2013. ‘A Very Brief History of the James Bond Films of the Eighties’, for the Rotary Club of Berwick-upon-Tweed, Berlino's Steak House, West Street, Berwick-upon-Tweed, 22 October 2013. ‘The James Bond Films of the Eighties: Geopolitics, Ideologies and Cultural Relevance’, Film Lecture at Morpeth Film Library, Morpeth, 8 October 2013. ‘A History of Christmas Cinema’, Ash Wednesday Lecture for The Probus Club of Berwick-upon-Tweed, Berwick Parish Church Centre, Berwick-upon-Tweed, 13 February 2013. ‘Forgotten Classics of Christmas Cinema’, St Andrew's Day Lecture, The Stirling Smith Art Gallery and Museum, Stirling, 30 November 2012. ‘The Christmas Movie Book in 3D: A New Dimension in Festive Cinema’, for the official book launch of The Christmas Movie Book, The Stirling Smith Art Gallery and Museum, Stirling, 1 December 2011. ‘Weaving A Cloud of Witnesses: An Editor's Tale’, for the official book launch of A Cloud of Witnesses, The Stirling Smith Art Gallery and Museum, Stirling, 27 October 2011. ‘A Christmas Movie Timeline: 1898-2009’, Keynote Speaker at the 2011 Annual General Meeting of Ayr Film Society, The Carlton Hotel, Prestwick, 20 October 2011. ‘Seven Decades of the Christmas Film’, for the Rotary Club of the Carse of Stirling, The Terraces Hotel, Stirling, 5 January 2011. ‘The Twelve Films of Christmas: Themes and Tropes in the Cinema of the Festive Season’, Christmas Lecture at the Stirling Smith Art Gallery and Museum, Stirling, 15 December 2010. ‘The Thistle in the Ashes: A Very Scottish Apocalypse’, for the Transgression and Its Limits Conference, University of Stirling, Stirling, 29 May 2010. ‘A Brief History of the Christmas Film’, for the A Brush with the Bible lecture season, The Stirling Smith Art Gallery and Museum, Stirling, 17 December 2009. ‘Nothing Reel Exists? : Richard Linklater and Changing Interpretations of American Hegemony’, for the Interdisciplinary Postgraduate Symposium in Postcolonial Studies, University of Stirling, Stirling, 26 April 2008. ‘Global Concerns, Independent Minds: National Identities and International Ideologies’, for the School of Postcolonial Studies Workshop, University of Stirling, Stirling, 7 November 2007. ‘Liv Tyler in Modern Film and Popular Culture’, for Off the Page: The Stirling Book Festival 2007, The Stirling Smith Art Gallery and Museum, Stirling, 28 September 2007.